–Are, in many cases, quite intelligent. –Are individual beings whose lives have intrinsic value. –Have, in some cases, individual personalities. This is heady stuff, especially for fish lovers like myself, who fancy catching them and/or eating them. When we look at a fish fillet in a supermarket display case, side-by side-with chicken thighs, we know that chickens, despite the horrendous conditions they are raised in, could be rescued from those cages and live normal lives catching grasshoppers and laying eggs. I know this because I once hand-raised two chicks, Cheep and Chong, to adulthood. Cheep, the rooster, allowed me to carry him around as I would a kitten, even when he was fully grown. But fish? Can you imagine doing such things with a fish? Well, let me introduce Oscar. 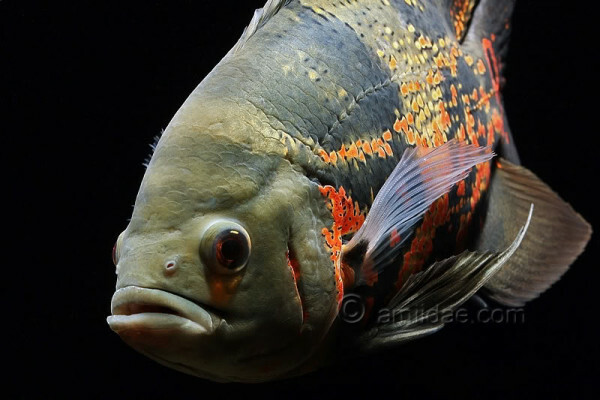 An Oscar, Astronatus occelatus, a cichlid that’s a popular aquarium fish. In 1974, when I still lived in Richmond with former wife Luci, I bought a 40-gallon aquarium and stocked it with fish recommended by the folks at a pet store, including a baby Oscar about 3/4 of an inch long. Within two months, Oscar was the only fish left in the tank–he had eaten the rest of them. Intrigued, I kept him and fed him goldfish (I know now from Balcombe’s book they are toxic to Oscars), and he grew to about five inches long and looked like the Oscar above, except that he was black and white. Then we decided to move to Albuquerque and I took him with us. I found a large styrofoam cooler, filled it with aquarium water, rigged a battery-powered aerator, and placed his new home of the front seat of a large rental truck for the 2,000-mile drive to Albuquerque. He and I exchanged stares for much of the way–he was always lying on his left side at the bottom of the cooler. Since it was November, I made sure to keep the temperature high in the truck and in the motel rooms we slept in. He made the trip fine, and I set him up in our new living room in the same 40-gallon tank. Oscar developed into a pet as friendly as a dog or cat. He recognized me when I came in the room, wiggling around and performing an elaborate dance. He would rise to the surface to be caressed on the top of his head. He gently took goldfish from my fingers and sucked them into his mini-maw. Oscar had a personality as distinct as any other animal I’d had, and in fact, had more personality and affection than guinea pigs, rabbits, and gerbils I had raised as a kid. Oscar died when our furnace failed one night due to a power outage, and the temperature in his tank dropped too low for a fish native to the Amazon basin. But I’ll never forget my favorite fish. 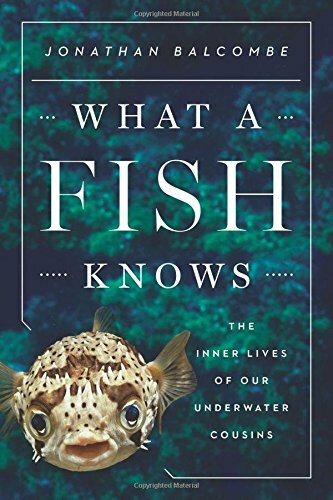 So you can see why I was predisposed to like and appreciate Balcombe’s excellent book that brings fishes into their their proper and well-deserved perspective.